The variability in the coloring of the three edible species already described brings them occasionally into such close similarity with the gamut of color of the one common poisonous species of the group that this enemy must also be familiarized ere we venture too confidently upon our Russula diet. 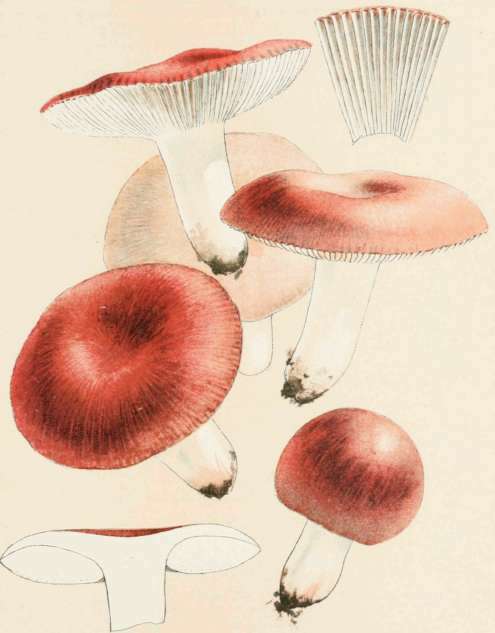 The Russula emetica (Plate 13), as its name implies, is at war with luxurious gastronomy, but its distinction from the harmless varieties is, after all, quite simple. Its frequent general similarity to Russula lepida and Russula alutacea is such that the amateur should hardly rely upon the botanical characters alone. There is but one safe, as it is a simple, rule for him: He should taste every specimen of his Russula of whatever kind before venturing upon its use as food. All of the sweet and palatable Russulae are esculent. When he chances upon the Russula emetica he will be aware of its important demoralizing resources in the peppery-hot tingle of his tongue, which, if not instantly perceived, will within the space of a minute assert itself distinctly. All such acrid specimens should be excluded, as a single one would be sufficient to bring an ignominious denouement to an otherwise delectable feast. In the typical Russula emetica the pileus is a bright, brilliant red - which, as we have said, is very variable, as indicated in our plate - often polished and shining; the gills broad, equal, straight, continuous, not crowded, and white, as is the flesh beneath the peeled cuticle. The stem is white or pink. The cap will average, perhaps, three inches in diameter, though occasionally reaching the dimensions indicated by the marks in plate, or even larger. Pileus: Expansion two to four inches; color varying from pale bright pink to deep scarlet; very smooth. Gills: Broad (in section), mostly equal in length, and continuous from edge of cap to stem; not crowded; white. Spores: White, like all Russulae. Habitat: Woods, with other Russulae. Note. - While, for conservative reasons, the poisonous reputation of this species is here perpetuated, it is quite probable that such condemnation is unwarranted, except as to the raw mushroom. The peppery tang and demoralizing powers are now claimed to be dissipated in cooking, and the Emetica will doubtless soon be more generally included with its congeners among the esculents, thus bringing the entire genus Russula into the friendly group. Captain Charles Mcllvaine is largely responsible for this conversion in favor of Emetica. His individual experiments warrant him in pronouncing this species "as good as the rest" when cooked. Others of the writer's acquaintance, following his example, echo his opinion.